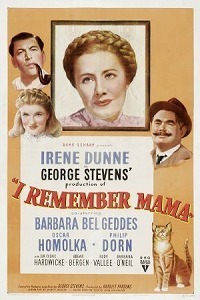 The play was adapted for a 1948 feature film written by DeWitt Bodeen and directed by George Stevens. The film begins with eldest daughter Katrin completing the last lines of her autobiographical novel. As she reminisces about her family life, we flashback to 1910, where the first of a series of vignettes finds Marta Hanson preparing the weekly budget with assistance from her husband Lars, daughters Katrin, Christine and Dagmar, and son Nels, who announces his desire to attend high school. Each family member offers to make a financial sacrifice to contribute to the boy's education.